When you think ‘Sahara desert’ your mind’s eye probably conjures images of tawny, windswept dunes stretching monotonously into the horizon. But satellites have a way of giving us a strikingly different, often much more interesting view of our world. 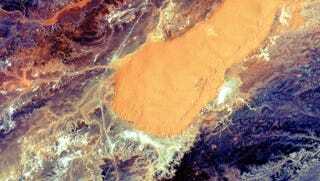 The area pictured here is about 90 km south of the El Ménia oasis – also known as El Goléa – in Algeria’s Ghardaïa province. Running north to south just left of the large sand dune at the centre, we can see a road that connects El Ménia to Ain Salah to the south, which was once an important link on the trans-Saharan trade route. The heat and lack of water render vast desert areas highly unwelcoming, making satellites the best way to observe these environments on a large scale. In addition, optical imagery of deserts from space is arguably the most fascinating: the diversity and untouched state of these landscapes produce unique and striking scenes. The Sahara is one of Earth’s natural wonders, just like the Amazon rainforest and the Himalayan mountains. Sometimes, we just need a different perspective to remind us.